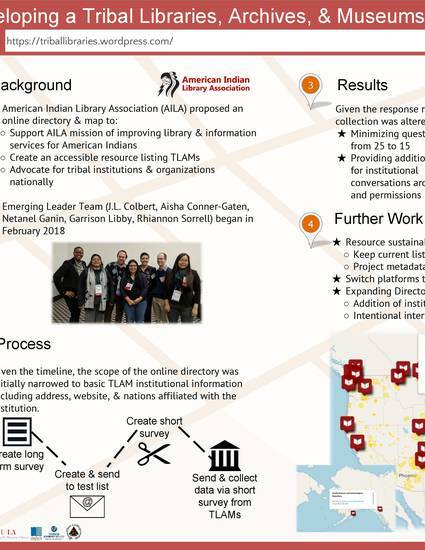 As a part of AILA’s proposed project for the 2018 cohort of Emerging Leaders, the project team created a digital resource to share the history of AILA and highlight US tribal libraries, archives, and museums (TLAMs) with the greater ALA , library, and education community. The project team created an online resource map to serve as a visual resource of TLAMs in the United States to be housed on the updated version of AILA’s website. In creating this resource, a number issues and concerns had arisen and were made cornerstones of the project. Issues of inaccuracy, privacy, and cultural competency, including the very definition of “Tribal Libraries” (and Archives, and Museums) were at the heart and creation of the directory. To present this digital resource to share the history of AILA and highlight US tribal libraries, museums, and archives with the greater ALA community. To inform audiences on the process of creating this resource, including the scope of the project and the challenges it continues to face. To advocate for the necessity of this resource, why it is needed and how it serves as an educational tool.